A twist on a classic chocolate sandwich cookie with crème in the middle with a spooky Halloween but better. These are soft and chewy without milk. I love Oreos! You can see that in two other posts that I have made Jumbo Oreo Cheesecake Cookies and Eggless Oreo Cheesecake Cookie Dough. In the past, I have made homemade Oreos but that was years ago and the recipe just didn't come out right. The cookies were really crunchy and had hardly any flavor and it took me many years to finally get a perfect recipe. 2. In a smaller bowl, combine flour, baking powder, baking soda and salt. Set aside. 3. In a larger bowl, cream together butter, dark brown sugar and granulated sugar for 5 minutes or until light and fluffy. 4. Add vanilla extract then half the cocoa-flour mixture. Mix. Add one egg. Pour in the rest of the flour then the last egg well combined. The dough will be sticky, that's okay. 5. Cover bowl and place in refrigerator for 1 hour. 6. While the dough is chilling cover cookie sheets with parchment paper. 7. With a cookie scoop or a tablespoon spoon, scoop out 1 1/2 tablespoons of cookie dough and place on pan with at least 2 inches space between cookies. 8. Place scooped cookie dough back in the fridge for 30 minutes. Colder dough bakes better so it won't spread. 9. Preheat oven to 325 degrees. Gently press cookie dough with the bottom of a measuring cup or small cup. Bake cookies for 10 to 12 minutes. Rotate pans halfway through baking. The cookies will be slightly cracked on top. 10. Remove from oven and let cool on pans for 10 minutes. Slide parchment paper off pan on a wired rack and let cool completely before adding crème. 11. Pipe with a sandwich bag on Halloween crème on one cookie then place another on top. Store in a cool place. These cookies are the cutest! And Oreos happen to be one of my favorite cookies! Yum! what a tasty recipe! Bet kids love it! How great to have this recipe! It will be so fun to change out the colors too. Thanks! What an interesting idea. I would never thought about making my own oreo cookies. These look yummy and easy to make, too! I love the combination of Oreo with the orange colour of the cream. Perfect for Halloween! These are easy to make and look great. These are so perfect for Halloween. We are having a little party this year. What a fun recipe to do this Halloween! I love the bright orange color as well. It definitely adds more fun to the cookies! Thanks for the recipe, appreciate it. Great idea for upcoming Halloween! My kids will love it ! these look so lovely, a perfect use of the extra brown sugar i've got laying around - and awesome for halloween parties! Love that these are dairy free! These look so good! I love cookies and the more chocolate the better! Super festive too! OK, these look seriously delicious! I mean, chocolate anything is delicious, in my experience - but even the great contrast of colors of the brown chocolate and orange creme look amazing! I wonder if these would taste good in a gluten-free version. These are so perfect for Halloween and I bed kids love them! This is going to take my kids Halloween to another level. They are going to love these so much!!! Thank you for sharing! These remind me of whoppie Pies which is a big thing is PA. I mean they have festivals for them. I know this is going to be something my children will love as we haven't had whoppie pis in so long. These look so delicious and perfect for Halloween, I am going to try this for the party next week. YUM!!! They look like whoopie pies!! Delicious im sure! These looks so fun! My Kiddies would love me forever for these!! Oh my goodness, these looks WAY too good. I think I'll just stay inside this fall and eat a bucket worth of these! I was about to say I've never actually seen any sort of pumpkin recipe like this before and then I realised there isn't pumpkin in it but it still looks delicious!! You have the best and most evil-est (in the best possible way) recipes! I want to make and eat everything!! Thank goodness you can't much on your monitor! Wow this really some cool idea to try out for Halloween. The color choice is perfect. 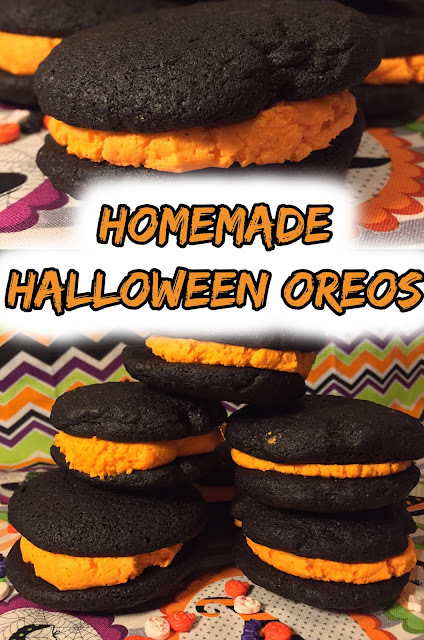 These look pretty yummy and fun for Halloween! My kids would enjoy helping to make them too. I love oreos! I want to try this over the weekend. I hope it comes out as the real oreos, lol! Woow! These looks amazing. Loving the Halloween spirit and they look so damn tasty! This post came right on time! I can't wait to try it out - my fave - Oreos!